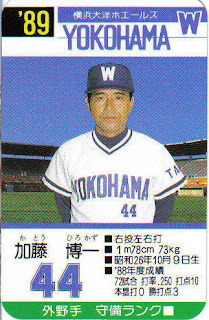 Deanna Rubin's latest post includes the sad news that former Yokohama Taiyo Whale Hirokazu Kato has passed away at age 56. His obituary can be found here. 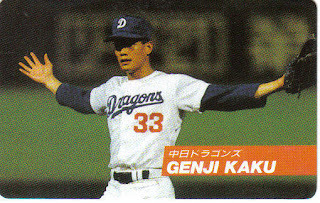 Kato ended his career just before BBM started producing cards so I only have two cards of him - from the Takara Whales team sets in 1988 and 1989. Since this was what I like to call Takara's "mug shot" phase, the pictures on the cards are nearly identical. 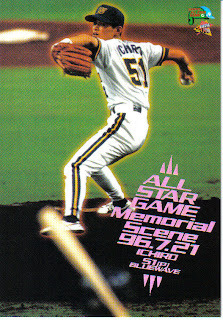 I've included a scan of the 1989 card here. Deanna's post also mentioned this picture of Shigeo Nagashima, Sadaharu Oh and Isao Harimoto together. I thought I'd post a card showing two of those three back when they were active players (card T-01 from the BBM Century's Best 9 set). 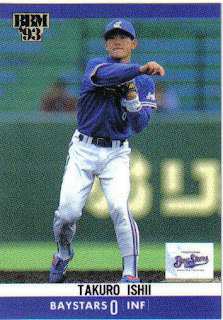 Deanna also has posts #2 and #3 in her series on baseball card shopping in Japan now up. I once caught a fish tthhiiiss big. 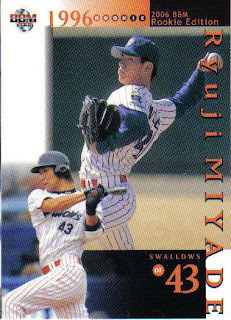 In a comment about this post talking about Takuro Ishii's previous life as a pitcher, Deanna Rubin mentioned another player who switched from pitching to hitting: Swallows outfielder Ryuji Miyade. 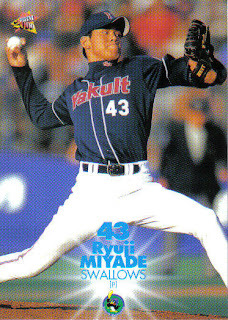 Miyade was a pitcher for the Swallows up until 2001 or 2002. He then switched to the outfield and has been there ever since. His cards up until 2001 show him as a pitcher. His cards from 2003 on show him as an outfielder (he doesn't have any BBM cards in 2002 that I know of). 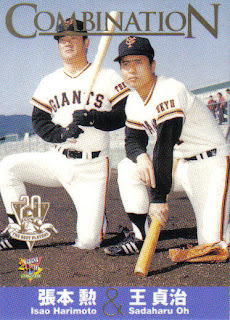 Obviously, Ishii and Miyade are not the first to switch from pitching to hitting. 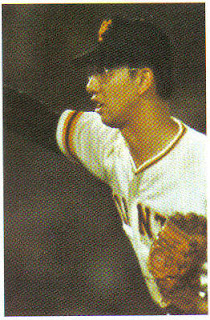 Dragons Hall Of Famer Michio Nishizawa did it among others (including some guy named Ruth in the States). This is BBM's first card of him. 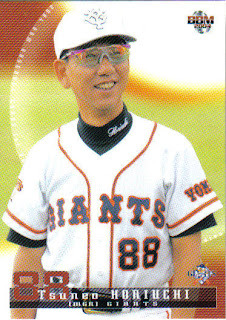 It looks like he has earlier cards in the 1992 Calbee set and the 1990 Takara Whales set. 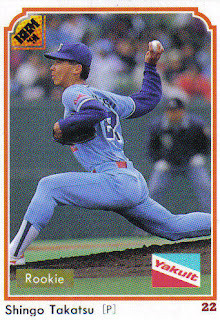 I don't know if the 1992 card shows him pitching and I don't know if either card lists him as Tadanori. I do know that this was the only year he wore uniform number 0. He was 66 prior to this and 5 afterwards. Koji Yamamoto and Tsuneo Horiuchi have been elected to the Japanese Baseball Hall Of Fame. 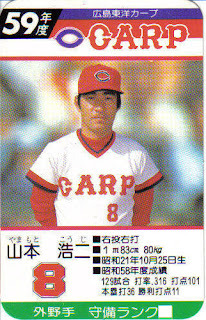 Yamamoto was a slugger for the Carp in the 70's and 80's and managed them in the early 90's and then again in the early 00's (is that what we call this decade? ), taking them to the Series in 1991. 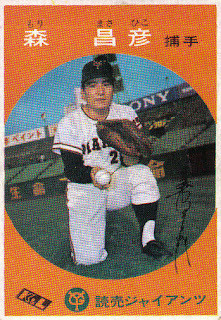 Horiuchi was a pitcher for the Giants in the 60's and 70's and managed them in 2004-05. He was nicknamed "Bad Boy Taro" for his off-the-field escapades in the 1960's. The Kabaya-Leaf cards were the first Japanese cards to resemble American cards. I'll have to a blog entry for them at some point, but suffice it to say that they are very cool, very popular and very rare. "Historic" - This set has some sort of theme and contains both retired (OB) players and current players - usually the same number of each. BBM started doing these sets in 2002 (well, really late 2001). The sets so far have been All Time Heroes (2002), Sluggers (2003), Golden Arms (2004), Glorious Stars (2005), Record Makers (2006), Draft Story (2007) and Back To The 70's (2008). Theses sets always have a "Historic Collection" icon on the front of each card. They typically come out in November. Rookie Edition - This is a draft pick set. In addition to the cards of the draft picks, there's a group of cards of current players, usually showing a picture of them from their rookie year. This set has been produced each year since 2003. It replaces a set called Preview that BBM produced from 1999 until 2002. The Preview sets would typically contain 10 cards per team, with the 2000-2002 sets including a card of the team's top draft pick. Rookie Edition is released some time in the winter. 1st Version - This is BBM's largest set. It contains roughly 35-40 cards per team plus cards for the managers and team checklists. It also contains cards for the statistical leaders for the previous year. It is usually released in April. All Star box set - This set contains cards for all the players who are selected to the All Star teams, as well as the manager and coaches. Since the set comes out right around the time of the All Star games (mid-late July), the cards do not show action from the games themselves, although there are usually cards celebrating the MVPs from the previous year's games. These sets have been produced every year BBM has been making cards (since 1991). The first ten years the cards were roughly the same design as the regular BBM set. Since 2001, the cards have had their own design. 2nd Version - This is a smaller set than the 1st Version, usually containing 9-15 cards per team as well as an update subset for the 1st Version. Other cards in the set might highlight 1st Pitch ceremonies or notably events in the first half of the season. This set usually comes out in August or September. From 1991 to 2001, BBM only produced one "regular" issue set (I'll leave discussion of Later Series sets for another time). BBM started producing the 1st and 2nd Version sets in 2002. From 2002-2004, these sets were roughly the same size - about 30 players per team. The current differences between the two versions started in 2005. Touch The Game - This is BBM's "high end" set - think Topps Finest or Upper Deck SP. I can't really say more about it because I've always avoided the "high end" sets - typically they cost more money and I find them to be very ugly. BBM has been producing Touch The Game sets since 2002 (I think). They replaced the Diamond Heroes sets that BBM produced from 1996-2001 (which were also expensive and ugly). I think Touch The Game usually comes out in late summer. Team Sets - BBM produces a 100 or so card set for each of the 12 teams. Typically these sets will contain cards for every player on both the major league and minor league roster along with subsets like team leaders, etc. They will occasionally contain OB players in historic subsets as well. Originally, BBM published team sets as box sets during the 1990's. I think the first was a Tigers box set in 1994. BBM's first team set that was sold in packs was the 1999 Tigers set. Other teams were added in the following years until 2003 or 2004 when sets for all 12 teams were first produced. These sets usually are released anywhere from March through August. Climax Series box sets - Starting in the mid to late 1990's and continuing until the Japanese leagues instituted the current play off system (the Climax Series) (Pacific League started in 2004, Central League in 2007), BBM would publish a box set for each league champion. Each set would contain 20-30 card for the players and usually a subset of season highlights. In 2004, they produced the Pacific League Playoff box set which contained 15 cards for each of the three teams in the playoffs. What it looks like they've done since then is produced small, 30 card box sets for each of the 6 teams in the playoffs. These sets are usually released in October. Like the All Star sets, the cards don't show any action from the playoffs. Nippon Series box set - I described this set in an earlier post. This set highlights the teams that compete in the Nippon Series. The cards actually show pictures from the Series. This set usually comes out in December. As was the case with the All Star sets, BBM has produced these sets every year they've made cards (since 1991), using a similar design to their regular set from 1991-2000 and a new design ever since. Take all this with a grain of salt. Just because BBM has produced these sets like this the last few years doesn't mean it will do it again this year. 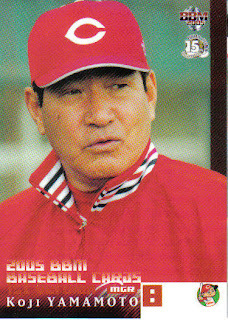 BBM will also produce additional sets that don't get made every year (like the Nostalgic Baseball set from 2006) and the occasional special set for a player that's retiring (like this year's Atsuya Furuta set) or coming to America (like the 2003 Hideki Matsui set or last year's Masumi Kuwata set).